Mini Split Air Conditioner And Heat Pump - Is It Right For Your Home? A ductless mini split air conditioner or heat pump is a popular alternative for homes where installing central air is not a viable option. Many homeowners also use it to cool and heat a particular room, such as an addition, three season porch, a bedroom in a far corner of the house, or a garage space. Average costs to install this system start at $2,900-3,900 for a single zone unit, and $5,200-7,300 for 2 zone system, depending on the capacity, efficiency and quality. If you have more rooms in your home, just add $2500-2700 per additional zone. These includes labor and materials. 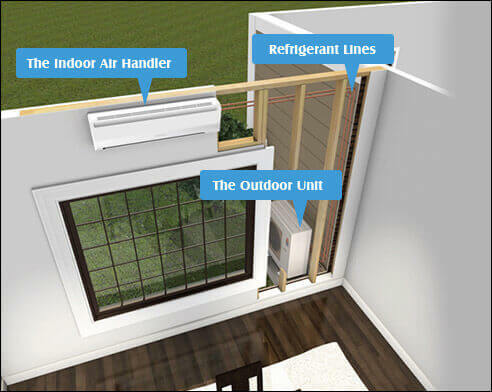 While mini splits have been very popular throughout Europe and Asia for the many years now, homeowners in US have also started to catch on to the benefits ductless ac has to offer. How does a mini split work? A ductless system cools and heats your house without using a system of ducts. One indoor unit corresponds to one outdoor compressor. This compressor carries refrigerant and power to the interior unit via a small pipe, running through a small opening. 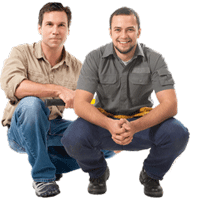 The refrigerant is delivered directly to an air handler located on the wall or ceiling of a particular room. You can have a separate thermostat attached to each air handler, and thus set different temperature levels in different rooms of your house. Installation is fairly easy and does not require any major construction. You can get free estimates from local HVAC pros, to figure out if a mini split would be a good fit for your house. If you also want heat, you will need to install a ductless heat pump. It will supply both heating and cooling to your home. Most popular brands are Mitsubishi (Number 1), Daikin and LG. While there are units that cost as little as $700-800, its best to get one that offers better quality, usability and will last longer without breaking. Decent quality models cost about $1,100-1,500 (single zone that includes one air handler). When is it best to use ductless heat and air? 1. You have an addition that you need to heat and cool, and don’t want to spend thousands of dollars on installing ductwork. 2. There is an attic or a garage space that you want to heat and don’t want to, or cannot install ductwork. 3. You live in an old house, where structurally it would be too difficult and expensive to install a new system of ducts. 4. The house is relatively small (under 1500) and ductwork cannot be easily installed. 5. If you have central heat and AC, but want a supplemental system when temperatures get either too hot or cold. Ductless can work well in particular rooms of the house that don’t get adequate heating or cooling from the central system. Compared to portable AC units, which go inside the window, you can barely notice when a ductless unit is turned on and running. It speeds up and slows down based on the needs of the system, instead of shutting off entirely like a traditional HVAC compressor. This can save energy, because a lot of energy is consumed during compressor start-up. An Energy Star Rated ductless unit can save you up to 30% in energy costs, compared to central air. This is because in many central ac systems, air is lost through leaking ductwork. If ducts have been poorly installed, air leaks will also happen. This would not be an issue with a mini split. A ductless unit can be great even when you have central air in your house. For example, if you have one room with increased heating and cooling needs, you can meet this demand without extending ductwork. You can set up specific temperatures in different rooms, according to your own needs. This is typically not possible with central AC. Also, there is no limit to the amount of heating and cooling zones you can have with ductless air conditioning. To illustrate just how efficient a mini split is – late models Nissan Leaf electric vehicles, as well as Tesla EVs now come with a heat-pump heater. They get extra 10-15 miles on a single charge in the winter, compared to a traditional heater used in older models. Newer high end Motorhomes / RVs now also come with a Heat Pump option/upgrades, to provide more energy efficient heating and cooling. In both examples not only energy cost is a concern, but also the AMOUNT of energy available. This is because both EVs and Motorhomes/RVs have a very limited amount of electricity to operate these power hungry HVAC systems. That is really nice that you could have a ductless split system unit even if you have a central air unit. Maybe that is something I could get for my room since it is usually pretty hot. This is something I will have to look into sometime soon.